For more Wordless Wedness, click here. At first I thought it was some sea creature. My kids have some squishy, light-up toys that look like this! OOh spikey. I agree with Sandy - I thought it was a sea creature, too. Great shot! I love the detail! Wow! That's an amazing photo! 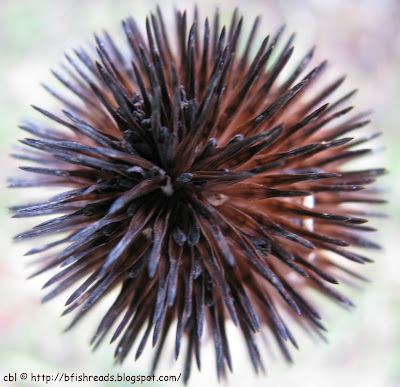 great shot, at first I thought it was a sea urchin so I'm glad you posted what it was. Very cool!! I like this one a lot. That's funny that everyone seems to think it's a see urchin upon first glance. It took me a minute to figure out it's some kind of plant gone to seed... maybe a thistle? Nice shot. Great perspective. For some reason, I was expecting a snow shot! Something I wish our camera could do! I absolutely love this shot. I wish I could take pictures like this. Beautiful. I have to start looking at things close up. way close. It looks a lot like the echinops I have in one of my flowerbeds. Wow, that's sure a spiny specimen. Nice close up. That is one cool shot, it looks so much like a sea anemone. A spiky beauty! Have a good weekend.